Lots of folks who claim being in touch with active trends such as art, music, and humor are indeed the very same people who subscribe to the morning newspapers. Or what's left of them. Seems that my morning paper keeps getting thinner and thinner. It's sad to witness what's become of the longtime tradition of the press. Who knows, maybe that's the results of mainstream ideas being watered down by left-wing editors imposing their socialistic views. As a guy who has worked with the media his entire career, sometimes I wonder how I survived the madness and the newspaper business didn't. Fortunately, I can still get the morning paper at my residence way out here in the boonies. I love reading the paper with my morning coffee. Personally, my reading habits have never changed. You see, every morning I always scan the sports section first for the latest game day scores. Then I read my horoscope allowing me to plot my daily strategy. All while saving the best for last when I finally indulge myself into my favorite page, the cartoon section. Ah yes, now we're talking. There I feast on everything from sophomoric humor to mindless comedy. Then I flip over to the editorial cartoons for a more sophisticated satire with a political twist. Doesn't matter about the content though, just as long as I laugh or smile at it's zany tones. My favorite cartoons are the one's which score big with musical themes. Those rib ticklers hit home. It's smart how cartoonist target mainstream audiences while recognizing the widespread acceptance of Pop Culture. 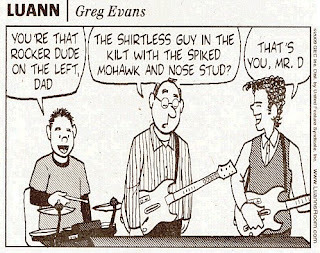 For example, who would'a thunk that households nowadays might embrace the topic of heavy rock bands like Led Zeppelin or Aerosmith in the funny papers? Time seems to have a way of catching-up with the modern trends of our society. 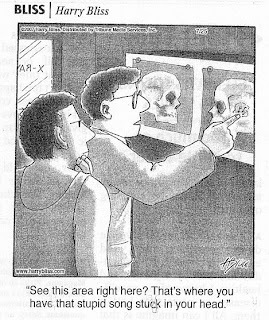 I like it though, kids and adults laughing together at the same comic. As you have it, these cartoons bridge the generation gap together for a moment. Who knows, does that mean in the future that similar advances in the cartoon world will exceed our expectations? Intrepid forecasters suggest that someday comical fashion statements like neck & facial tattoos or eye-brow rings will be openly accepted in the classrooms of our Middle Schools or the neighborhood chapter of The Girl Scouts? Hmm...Unless I'm mistaken, that's a slippery-slope. By all accounts, I have learned so much from the comics. They can just about put humor into any situation. Simply put, I have learned to laugh at the serious and non-serious side of our existence. 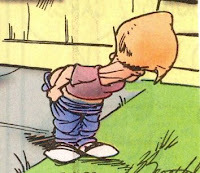 With that being the topic, let's review some favorite cartoons that reflect that essence. 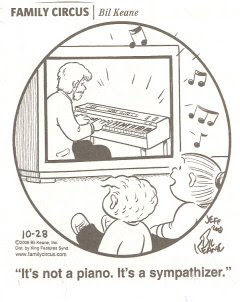 The cartoon above always makes me think of former colleagues Keith Emerson and Rick Wakeman. In the early days of progressive rock, synthesiser's were the key instrument in parlaying the techno-rock sound. Emerson and Wakeman were spectacular showmen and the architects in the classical rock movement. 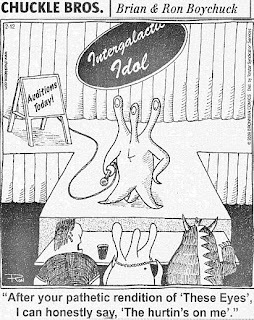 The American Idol TV Show debuted in 2002 and has since become one of the most popular shows on television. Auditioning contestants that come on the show are subject to the judge's flattering comments, or, as seen above, a humiliating review - Simon Crowell style. 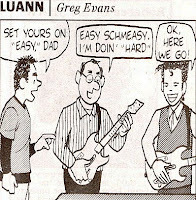 The song being referred to in this cartoon is by legendary Canadian rock group, The Guess Who. Has this ever happened to you? Spend an entire day humming a song and then you gotta pay a friendly visit to the doctors office to get it diagnosed. Funny how you can get a read on a person's personality by thumbing through their music collection. For example, if they got the Miles Davis music collection or some Charlie Parker albums, you tend to think they're pretty cool. Right? And if they got Hanna Montana or The Jonas Brothers, you know they probably got kids. Or at least you hope they got kids. 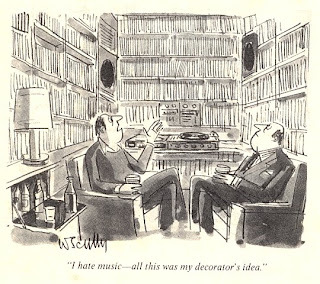 However, if you get cornered in their music library when they pull out their favorite albums by Yanni or Jamiroquai or Clay Akin, just play it cool and ask them if they possibly have the latest albums by either Celine Dion or Kenny G?